Carp to mid-20s as well as tench and bream are the main targets at Cobbleacre. There's a tackle shop on-site with hot food available. Toilets and showers on-site too. Tourers are very welcome, and holidays can be booked in their statics. A beautiful mature 3.5 acre lake with depths from 5 – 13 feet. This specimen lake is perfect for carp fishing; any angler will fully enjoy this lake. Features include; islands, deep margins, lily pads and thick reed beds along with a variety of bottom features. Tickets for the specimen lake run for 12 hours starting at 7am. There are limited numbers allowed on this lake. If you would like to fish this lake we do advise you to book in advance by calling 01603 754305. This will ensure you a place but does not guarantee you a specific swim on your visit. This is the runs water and is perfect for the carp angler. The lake is roughly 3 acres in size with depths ranging between 3ft – 7ft. Features include; islands, lily pads, reed beds, good margins, overhanging trees. The lake bed is mostly thin silt. ▪	Roach, Rudd & Perch. This is the fun lake. An odd shaped lake being only ¾ acre in size with depths from 2ft – 6ft. This lake is a good start for any beginner. Features of this lake include; over hanging trees and bushes ideal for holding carp, lily pads & good margins. This is the match lake. *A 2 ½ acre lake oval in shape with two islands 12 – 26 metres from the pegs. The lake has depths of 3ft – 15ft & 34 pegs. Features of this lake include; lily pads, overhanging bushes (carp cafés) & deep margins. The lake bed is mostly hard clay with patches of silt. This lake can be fished on a day ticket providing no matches are being held. For more information on matches at Cobbleacre or to book a match, please call the bailiff on 07879816181. 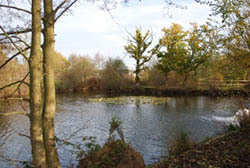 An old traditional pleasure lake set in 1 ½ acres with depths from 2ft – 9ft. This lake is ideal for the pleasure angler. Features of this lake include; islands, reeds, lilies & overhanging trees. The lake bed is mostly hard clay with patches of silt. Day tickets start at £7, for more details on pricing and the lakes, visit their website.